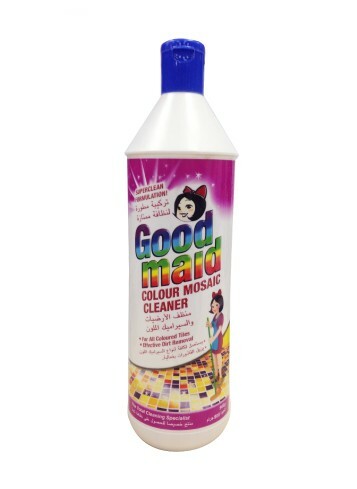 Colour Mosaic Cleaner - Goodmaid Chemicals Corporation Sdn. Bhd. Super effective cleaner for toilet bowls, wash basins, bath tubs and other porcelain surfaces in household and industrial environment without causing damage to coloured tile surfaces. • Suitable for coloured tiles, marble, terrazzo and Italian tiles, ceramic, glazed and stainless steel surface. • Penetrates effectively to remove stubborn dirt and grease, rust, algae, mould, and water marks. • Also acts as a disinfectant and eliminates unpleasant odours. • Pour a small quantity of cleaner onto surface, leave for a few minutes, then rinse with water. • For heavy stains, apply cleaner to heavy dirty stained tile or the area surface, let it stays for 10 minutes, brush, then rinse with water. Repeat the step when needed. Contains properties that kills 99.9% of harmful germs and bacteria.